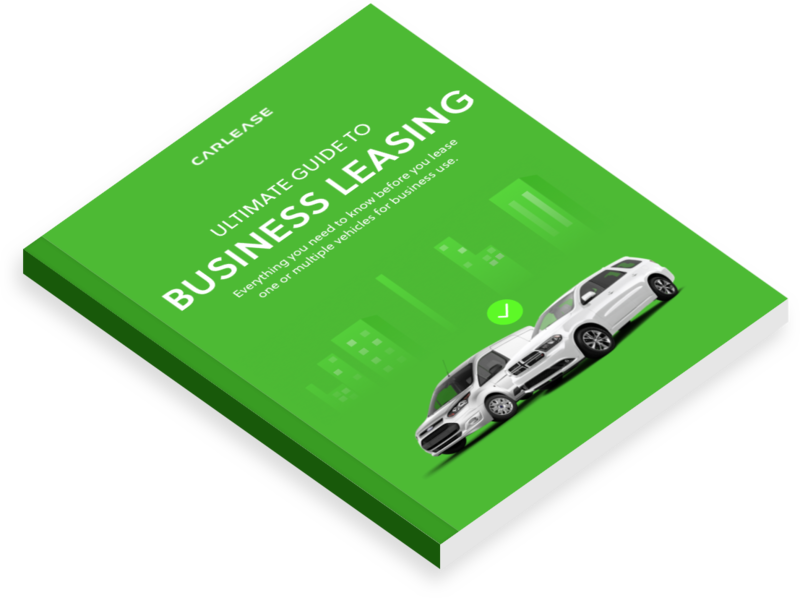 Everything you need to know about business leasing; the best way to acquire a fleet of vehicles. What Is the Business Leasing Process? Today, more than 80% of Fortune 500 companies choose to lease vehicles and equipment instead of traditional financing or purchases. In the simplest sense, business car leasing is a hassle-free and cost-effective way to provide new business-use vehicles for your employees. Leasing allows business owners of all sizes to choose the best terms and number of miles to be driven. As the more attractive and flexible solution, you can lease any number of vehicles and choose the best combination of vehicles to meet your business needs. The experts at Carlease.com will help you understand all of your options and customize a lease that meets your needs and exceeds your expectations. When it comes to leasing vehicles for your business, you can choose between closed-end leases vs open-end leases. Setting length of the lease (12 months up to 48 months). If the you (the lessee) exceeds the number of allowable miles, you could be responsible for excessive mileage charges ranging from $.10 up to $.15 per mile. At the end of the lease, you'll have the option to purchase the vehicle at the residual value or return the vehicle to the lessor. While this type of lease may work for most consumers and some businesses, companies who drive significantly may not be best served by a closed-end lease. Open-end leases or terminal rental adjustment clause (TRAC) leases are much more common for commercial use because these contracts allow you (the lessee) to assume the depreciation risk. This means you can set more flexible terms based on the needs of your business — even open-ended mileage restrictions, so your employees can drive as needed. At the end of a open-end lease, you can choose to purchase the vehicle for its residual value or pay the difference between the vehicle's market value and its residual value. In other words, you'll pay the bill if the depreciation on the vehicle is worse than expected. What Are the Benefits of Business Leasing? Whether you choose an open-end business lease or a closed-end business lease, you'll enjoy a unique set of highly attractive benefits. Tax Advantages - Your monthly business lease payments may be 100% tax-deductible as a business expense. Lower Monthly Payments - Business leases have significantly lower monthly payments in comparison to purchases. Lower Maintenance - Regular maintenance may be covered under your fleet management agreement. No Repair Expenses - Since the manufacturer's warranty is likely to be in effect the duration of your lease, most repairs will be covered for no out-of-pocket costs. However, you'll still be responsible for suggested manufacturer's maintenance items — unless you opt for a maintenance package. Simple Turnover - At the end of the closed-end lease, you simply turn the vehicle back in without worrying about disposing of the vehicle or trying to sell it. Flexibility - You can customize your lease to best benefit your business. Whatever your business needs, Carlease.com can help you find the perfect lease for you. Less Up-front Costs - Financing vehicles typically require around 20% of each vehicle's value, which will be a substantial down payment; while most leases have very little to no down payment. Businesses Are More Appealing to Lenders - Traditional financing can cause your business to take on more balance-sheet debt. Because leases are off-balance sheet expenses, your company will look leaner and more agile, which is favorable to most lenders. Control Business Image - With a lease, you retain control over the vehicle image presented by your employees. For instance, if you're a company committed to the environment, a fleet of hybrid or electric vehicles will speak volumes about your brand. Customization Options - Depending on the terms of the lease, you may be able to further customize the vehicle to give your marketing efforts new legs, with decals, wraps, etc. Mix and Match Vehicles - Long gone are the days when you have to choose a monotonous fleet of vehicles with one make and model. Today, Carlease.com allows business owners to mix and match different vehicles, including different makes and models. Lease Payments Are Easier to Deduct — You will no longer have to worry about complex depreciation schedules on assets that may or may not reflect the true market value of owned and used vehicles. Instead, lease payments are much easier to deduct. Why Choose Carlease.com for Business Leasing? Carlease.com is large enough to provide solutions for your business's unique needs; while being agile enough to get to know your business. We serve businesses of all sizes, and our goal is to add value by working as a flexible extension of your company. No Fee - Carlease.com doesn't charge you a fee, and there are no add-ons or hidden fees. Scalable - Regardless of how large or how small your fleet is, Carlease.com can help! Concierge - We provide a white-glove, high-touch, concierge car lease service uniquely designed for today's busy business owner. Free Delivery - The Carlease.com fleet leasing team will deliver your fleet of vehicles directly to your business. Flexible Options - Choose open-end business leases or closed-end business leases. No Pressure, Hassle-Free Experience - You can browse vehicles and even request more information on any vehicle without having to worry about pressure to buy. We're here to help! Business Centric Advice - Carlease.com offers unbiased, expert advice only based on the needs of your business. We are not inclined to push you toward one vehicle or another — only what's best for your business needs. Best Prices and Terms - At Carlease.com, we use world-class technology and leverage our buying power to ensure you receive the best terms and price available. Customizable Vehicles - You can customize your fleet of vehicles with logos and a wide range of other options. Additional Services - Carlease.com offers access to a wide range of services. These include ADA compliance, graphics, vehicle delivery, titling and vehicle registration, fleet disposition services, and management. A La Carte Fleet Management - You can choose all of the fleet management services your business needs — and none of the ones you don't. At Carlease.com, we make it as easy as possible for you to lease a fleet of vehicles. From start to finish, we will guide you through the process while always placing the needs of your business first. Choose the Right Mix of Cars, Trucks, Vans, and/or SUVs. At Carlease.com, you can customize your fleet of vehicles by mixing and matching different types (cars, utility vans, trucks, etc. ), different makes (Toyota, Ford, Honda, BMW, etc. ), and different models (BMW 5-Series, Ford Transit Van, etc.). Choose Your Lease Duration and Mileage. If you're unsure the best lease term and mileage for your business, our experienced fleet leasing advisors are always available to guide you through the process. Get Your Free, No-Obligation Business Leasing Quote. Whether you're ready or just looking for options, you can receive a free, no-obligation business leasing quote on the vehicles you decide. Choose the Best Lease Financing Option. At Carlease.com, we've partnered with the leading lease financiers in the nation. We'll review all of your options — including manufacturer offers — to ensure you get the best financing terms. Place Your Business Lease Order. Once you've found the perfect fleet of vehicles, the right term, mileage, and financing option, we will review your order and provide you with the proper documentation. We Deliver Your Business Fleet to You. One of the primary reasons business owners choose Carlease.com is our high-touch, white-glove delivery service. We will bring your fleet of vehicles to you and ensure all documentation is signed. Is there a price difference between business and personal leasing? LLCs, Corporations, S-Corps, Partnerships, and Sole Proprietorships are eligible to lease a vehicle through the business. In most instances, there's no difference in pricing between business and personal leasing. However, occasionally manufacturers will offer special rates for businesses only, which could result in a benefit to lease through the business. In addition, leasing through your business also offers potentially significant tax implications. In the end, you should consult your accountant for concrete direction on the cost effectiveness of each option and which is best for your business. Where does Carlease.com get the vehicles from? Similar to a dealership, all of our vehicles are supplied or sourced through a national network of partnering dealerships. What if I don't see the exact model my business needs? In the rare event you don't see the exact vehicle you need, let us know! We offer highly competitive leasing solutions on all makes and models. While we make every attempt to keep our website as accurate as possible, we are continually entering into new agreements with dealers and manufacturers. Simply give us a call, and we will work to understand your needs and provide a solution. What should I consider when choosing between an open-end lease and a closed-end lease? What are your driving patterns and overall fleet usage? Is your business risk averse or can you tolerate a considerable amount of risk? How involved will your business be with fleet management? Will your business's budgeting, cash flow, and accounting needs generate a competitive advantage from one type of lease? Why not just go to a dealership? Dealerships are excellent retail solutions. However, business leasing requires a considerable amount of expertise within the arena. At Carlease.com, we'll help you see the whole picture and make sure you understand the pros and cons of each viable choice. In addition, Carlease.com allows you to shop all manufacturers and financiers; while most dealerships will limit your ability to a single manufacturer. How much is required for a business lease down payment? At Carlease.com, we can tailor your upfront payment or initial payment to meet your needs. In general, the higher your upfront payment, the lower your monthly business lease payment. Why are lease payments less than finance payments? When your business purchases a vehicle through traditional financing, you'll pay for the full negotiated value of the vehicle over the term of the loan. In contrast, a business lease only requires you to pay for the depreciation on the vehicle, which is the portion of the vehicle your business uses. Most business lease contracts range from 24 up to 48 months. However, your Carlease.com business leasing specialists will work closely with you to understand your needs and goals. Then we can provide an unbiased suggestion based on the information you provide about the best lease term. Who is responsible for insuring the leased vehicle? When your business leases the vehicle, you'll be responsible for having the proper insurance coverages. Why should my business lease from Carlease.com? At Carlease.com, we specialize in business leasing. Our knowledge and experience has allowed us to forge viable relationships with manufacturers, dealerships, and the most prominent leasing and finance companies. In addition, our commitment to volume allows us to negotiate the best discount, so you'll enjoy the most competitive vehicle specials and attractive rates available on the market. Does Carlease.com take trade-in vehicles? If your business already has a fleet of vehicles you own, we can take your existing fleet "in on trade." We will apply any positive equity you have toward your next lease. We're opting out of the company car program, what's the best solution? At Carlease.com, we are specialists with business leasing and offer years of experience helping business owners manage their car allowance program. We always advise businesses to first familiarize yourself with the makes and models that would work best. After you have narrowed the list down, we encourage you to call us! We will put our decades of business leasing experience to use to help you successfully navigate your way forward. Unlike other business car leasing solutions, we have the versatility to meet your business's unique needs because we are not tied to one or two specific manufacturers. Because we offer vehicles from all manufacturers, our solutions are not driven by manufacturer quotas. Instead, we're driven by what's best for your business and goals. Why does the monthly payment increase with the number of miles? When you lease a vehicle, you're only paying for the portion of the vehicle you'll use. If you expect your employees to drive a higher number of miles, they will — in theory — use more of the vehicle. In addition, the higher number of miles will cause the vehicle to depreciate faster, which will decrease the vehicle's market value. How many miles per year can I choose for my business lease? Whenever you start a lease, you agree to drive a certain number of miles. Depending on the finance provider you choose, the mileage can rage anywhere from as low as 5,000 miles per year up to 50,000 miles per year on a closed-end lease. However, with an open-ended lease offers much more flexibility. Can I purchase the vehicles at the end of the lease? One of the most attractive aspects of leasing a vehicle is the option to buy at the end of the lease. You'll know at the beginning of the lease the vehicle's residual value, which is what you can purchase the vehicles for at the end. Are you interested in leasing a vehicle for use in your business? At Carlease.com, we pride ourselves in our ability to customize your lease contract to best meet the needs of your business. Most importantly, you have the power to choose all of the services you need — and none of the ones you don't. You can add a comprehensive maintenance package to your contract for a marginal fixed monthly fee. The fleet maintenance package covers manufacturer's suggested maintenance, tire replacements, as well as other consumable parts. Choosing the maintenance package offers you an additional peace of mind — lowering overall costs of operation and reducing unexpected bills. A Carlease.com leasing expert can customize your maintenance package based on your mileage and contract length. No Unexpected Bills - Our maintenance package will protect you and your business against any unexpected maintenance or repair bills. Better Budgeting Abilities - With a fixed monthly cost, you can easily budget for all vehicle maintenance services. You also have the option to choose from flexible payment options. Trusted Service Centers - When you utilize one of our fleet maintenance packages, you'll have the flexibility to visit trusted service centers. All of the work performed on your leased vehicles will be documented and performed by a highly skilled and qualified technician. Protection Against Inflation - Our fleet maintenance packages offer protection against the rising costs of maintaining and servicing a fleet of vehicles. Instead of having to pay the going rate per vehicle, you'll have a locked-in fixed rate at the beginning of your lease contract. When it comes to leasing a fleet of vehicles, there are no one-size-fits-all solutions. Instead of taking this relatively common approach, Carlease.com offers a fully customizable selection of fleet management services. Does your business need 5, 10, 25, or 125 different vehicles? Whatever your fleet needs are, Carlease.com's Fleet Management Services can help. We bring decades of experience helping businesses of all sizes across all industries find the perfect mixture of fleet management services. We've partnered with leading Fleet Management Companies to provide simple and cost-effective solutions that will work for your business — regardless of size. The amount of involvement we have in the management of your fleet is completely left up to you. What Types of Fleet Services Are Offered? Carlease.com offers a vast range of fleet management services. Simply put, if you need it, we have the partnerships to provide the highest level of service. Regardless of your needs, our fleet management teams will ensure you have the best possible experience and work to make sure your vehicles are in service and on the road. Although no one wants to get into an accident, they do happen. And when an accident happens, Carlease.com is here to provide efficient and effective solutions. Our accident management service is a suitable option whether it involves at-fault accidents, under-insured drivers, or any other common scenario. Your business fleet drivers will have access to a convenient 24/7 accident hotline as well as access to our vast national network of repair professionals tasked with the single goal of getting your fleet back on the road as quickly as possible. Our expert team of business car leasing professionals bring decades of experience working in fleet management. We've become well versed in all forms of fleet management. Because of this, Carlease.com and our partners offer fully comprehensive fleet consulting services for a marginal fee. By working in conjunction with our accident management arm and your insurance carrier, we provide downtime support solutions, such as the management of the repair process all the way to the return of your vehicle(s). Carlease.com offers transparent and flexible daily and monthly rental support. We also offer management consultation solutions to help you control your short-term rentals in the manner best-suited to the needs of your business. Traditionally, the integration of legacy vehicles hasn't always been the most straightforward process. However, Carleae.com partners with leading service providers to make legacy management as seamless as possible for your employees and business. Other damages that are minor or have a small diameter of impact, such as less than ½ of an inch. Will the damage on the vehicle have a negative effect on its resale value? Is the damage the result of neglect or abuse? Is the wear and tear excessive in relation to the age and mileage of the vehicle? The terms used for business leasing can be confusing — especially if this is your first time leasing a fleet of vehicles. Even if it's your second or third time, you may hear a few words that leave you scratching your head. At Carlease.com, we pride ourselves in being exceptionally transparent, which is one of the reasons business customers of all sizes continue to come back to us. Let's take a look at some of the most common leasing terms you may hear in the process. Accident management explains the comprehensive management and oversight of situations caused by a motor vehicle accident involving one of your business fleet vehicles. Acquisition fee includes a range of administrative costs associated with the lease. This fee is also regularly called the "bank fee". Adjusted capitalized cost is the final amount your monthly lease payments are calculated on. This figure is the result of subtracting the capitalized cost reduction from the cap cost. Annual mileage will reflect the number of miles your fleet vehicles will be driven without incurring any additional charges. The annual mileage will typically range anywhere from 5,000 miles up to 50,000 miles — based on the terms of the contract. Capitalized cost or cap cost is the value of the vehicle you finance during the term of the lease. This figure is one of the primary drivers of your monthly lease payment along with interest rate. The capitalized cost is similar to the purchase price in a traditional vehicle finance scenario. Capitalized cost reduction or cap cost reduction is the amount of money your business puts down to the lower the cost of the vehicle. Cap cost reduction is usually optional and is in addition to taxes, first month's payment, title, and other fees. Contract length or term will be the length of time you agree to drive the vehicles. The term can range anywhere from two, three, or even four years. Depreciation represents the reduction in value of the vehicle due to the annual mileage accumulated and normal wear and tear. Depreciation can be calculated as the difference between the capitalized cost or purchase and the vehicle's value at the end of the lease (residual value). Disposition charges are fees associated with the end of the lease. Disposition charges are collected by leasing companies to cover the expenses associated with cleaning, preparing, and selling the vehicle. Excessive mileage charge is a fee generated if any of the vehicles have exceeded the contractual annual mileage agreed upon. Fleet management is a general term used to describe the collective services involved in managing a fleet of cars, trucks, vans, SUVs, or any other vehicle. Common fleet management services include financing, servicing & maintenance. GAP Insurance is a type of coverage that protects you in the event of a total vehicle loss. This insurance covers the difference between the amount owed on the lease contract and the market value of the vehicle. Lessee is the business or individual who will be leasing the car. If you're leasing a fleet of vehicles, your business would be the lessee. Lessor represents the entity that legally owns the vehicle or the leasing company. Money factor refers to the interest rate you'll pay on the lease. However, it's calculated differently than APR. The money factor is presented as a number like .0029. To convert the money factor to APR, simply multiply it by 2,400. Residual value is calculated prior to you signing the lease agreement and represents how much the vehicle will be worth at the end of the lease. The residual value is typically based on the Automotive Leasing Guide — and industry guidebook that provides the estimated value of new vehicles once they come off lease.